Three main objectives are defined. Within the basin, priority activities are fishing and marine farming. They need to have a favoured access and permanent to resource and they need a good quality of water. Fishery, marine farming and port activities are priority on the seashore. The port extension to the east is also part of the plan. 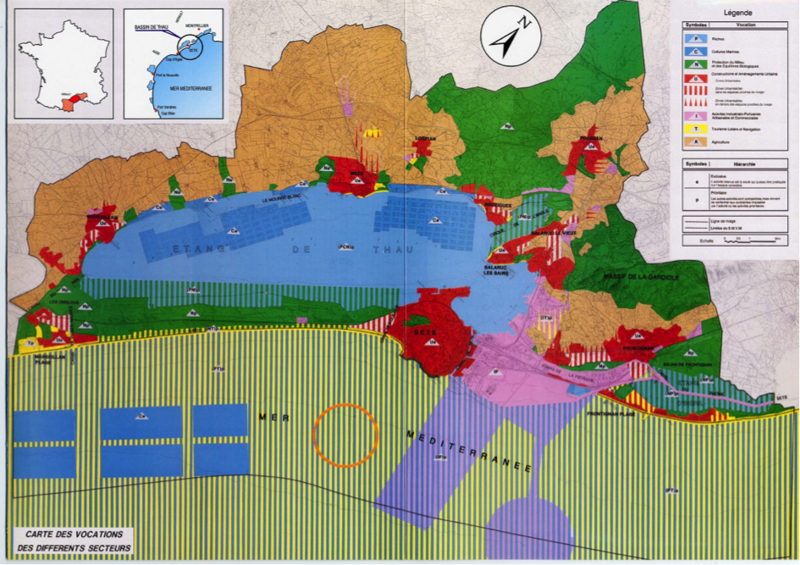 The third objective is the control of urban development on the catchment of the Thau Basin. Urban and industrial cities of Frontignan and Sete and its port. On the North and West banks, mainly rural municipalities such as Mèze, Loupian, Bouzigues, Poussan et Balaruc-le-Vieux, and touristic municipalities like Marseillan et Balaruc-les-Bains. The map below is the Thau Basin Schema de Mise en Valeur. The different colors show the different sectors of activities. These activities are also shown by type: exclusive (e) or priority (p). Other sectors can go together with a priority activity but have to comply with the latter’s constraints. The consultation was lead with the stakeholders (institutions, municipalities, professionals, associations ). The project was submitted for opinion to stakeholders and was publicly available for two month. More than 150 persons have been directly involved in the scheme development.